Centrally located in East Downtown. Our Blank Canvas Warehouse is located just walking distance from Minute Maid Park and other popular Houston attractions! Parking: The private driveway in front of Sharespace parks up to 4 cars, the parking lot to the right is a paid parking lot. It is conveniently located next door but we have no affiliation with the parking lot. They typically charge $5 but will increase the rate if there’s a game or something happening in the area. We do not have information about their rates ahead of time, it’s what’s posted outside on their sign. Our experience is that they don’t raise the rate unless there’s a public event happening in the area. Please be sure your guests pay them. There’s a pay station if no attendant. If the pay station is not working for some reason, use the cash slots behind it. Your car will be booted for non-payment. The parking lot to the left is a private lot for next door so no parking in that lot, YOU WILL BE TOWED. There is street parking around the building, follow typical parking signs, meters, etc. We encourage you to check game schedules before your event to fully prepare guests ahead of time for game days. Street parking and lot parking will be limited on game days. 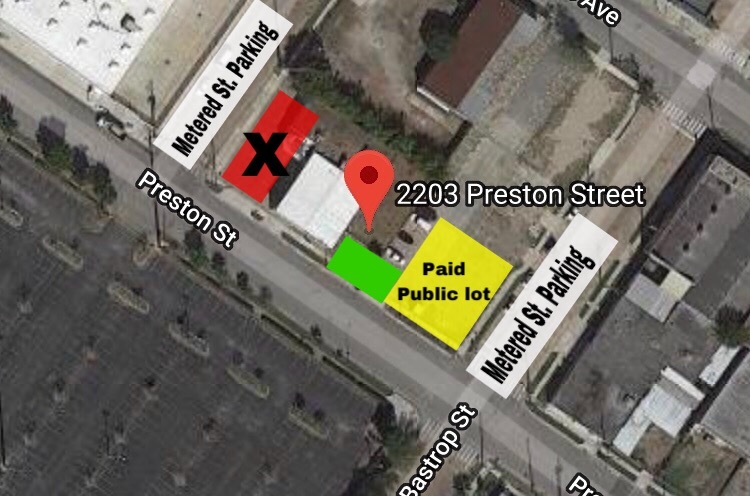 Paid public lots in the area (and the lot located next to us) will have raised rates on game days. We are are not affiliated with any of the public lots in the area and do not have information on lot parking/prices ahead of time. NOTE: We encourage guests to Uber/Lyft or carpool on game days and highly suggest hiring a valet service for your event if you are expecting 50+ attendees!